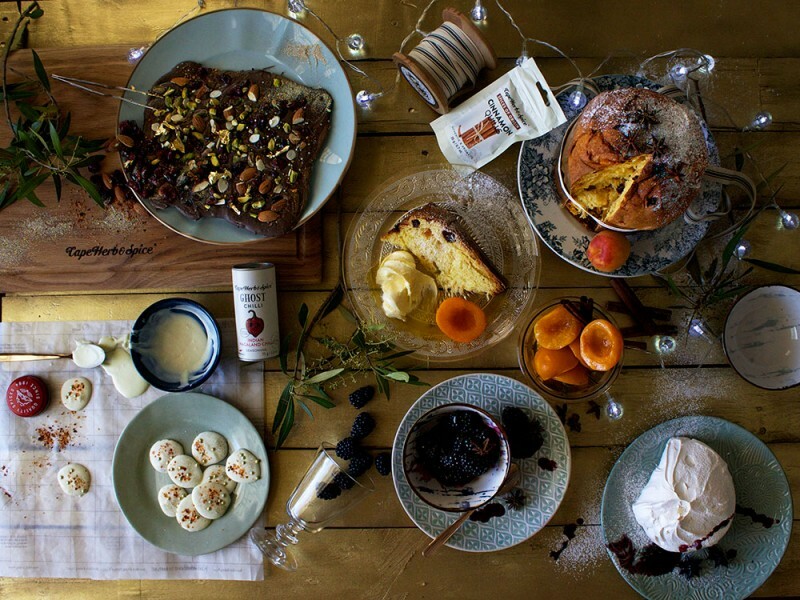 It’s beginning to look a lot like Christmas – time for friends, family and fabulous food. Fabulous of course doesn’t necessarily have to mean frantic, because with short cuts and a few clever tricks, you can lay on a festive spread that will wow. The secret is to have stores do most of the work for you, and then personalise it with special touches that will make it seem like you slaved away. Simply buy tins of half or, better yet, whole peaches. Make syrup by boiling together water and sugar with a handful of Cape Herb & Spice Cinnamon Quills. Then, add a healthy swig of brandy or Cognac and boil for another five minutes. Pour over the tinned peaches and you’re done. (The alcohol boils off so kids could eat this but if you’d rather not, simply leave the brandy out, the cinnamon will still give it loads of punch.) Serve your brandied cinnamon peaches warm or cold with mascarpone and thick slices of store-bought panettone. Boil red wine and sugar together with a few Cape Herb & Spice Star Anise until it forms a lusciously thick syrup. Top a store-bought meringue with vanilla ice cream or whipped cream and loads of blackberries, then spoon over the star anise syrup. You could do the same with fresh quartered figs. Instead of red wine, simply use a rosé. And instead of the star anise, drop in a few crushed Cape Herb & Spice Cardamom Pods. It’s summery yet incredibly spicily indulgent, just like a hot-weather Christmas should be. Elevate ‘everyday’ chocolate into something festively gourmet. Just melt white chocolate, drop spoonfuls onto wax paper and top with the teeniest pinch of Cape Herb & Spice Ghost Chilli Seasoning. Edible gold or silver balls complete the picture. For something more substantial, make fruit and nut chilli chocolate bark. Melt milk or dark chocolate (or a mixture of the two), pour onto wax paper and dust with a hint of Ghost Chilli, then top with chopped dried fuit and nuts of choice. Think cranberries, apricots, cherries, pistachio, brazil nuts or almonds. Go mad. Edible glitter and gold foil come next, because this is the one time it really is OK to shine.